One of the best ways to ensure that you save money when grocery shopping is to make sure that you are as efficient as possible when shopping. Disorganization and lack of efficiency almost always result in spending more than you intended to needed to spend. There is a ton of little things that can make your shopping trip less efficient and when these all get combined together, it can cost hundreds of dollars a year. here are a few ways to make sure that you are more efficient the next time you go grocery shopping. One of the best ways of making your grocery shopping trip more efficient is by creating a list. A list will help you stay organized and will make it easy to pick up only what you need. If you already know the layout of the store, you can just zoom through the aisles and be out of there in no time at all! Setting a weekly or monthly grocery budget will help you determine what you definitely need to buy during your trip to the grocery store. A budget will also help you write out your list of grocery items and ensure that you stick to the list. If you know the layout of your local grocery store, it will be much easier to shop. Not only will knowing the layout help you find everything you need, but it will help you to get in and out of the store quickly. The less time you spend in the grocery store, the less likely it is that you’ll buy unnecessary items. Moreover, knowing the layout means that you won’t be distracted by any extraneous items you might not have seen before. Browsing through the sales flyer before going to the grocery store is a smart idea for various reasons. As you shop, you’ll already know what’s on sale and what sales you might want to take advantage of. 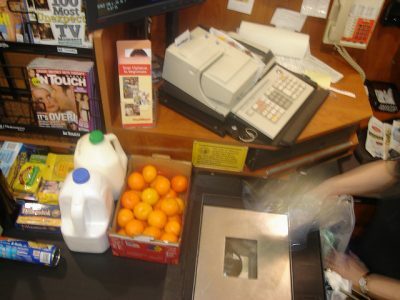 Knowing about sales ahead of time will make your grocery shopping trip much more efficient. Instead of standing in the aisle, finding a sale for the first time, and debating on whether or not it’s a good idea, you’ll already know whether or not you want to buy the product. There are plenty of online grocery shopping sites such as Peapod.com that allow you to place grocery order online that are then delivered to you at a pre-picked time and location. One of the great things about online grocery shopping is that you can save items you frequently buy so that, at a later date, all you have to do is add it back to your cart. Of course, you have to buy a certain minimum to qualify for delivery services, but online grocery shopping is pretty convenient. Typing an item into the site’s search engine is much faster and more efficient than strolling through the aisles of your grocery store. It might also be a smart idea to keep a list in your bag or on your phone that includes the common items you already have in your kitchen. Have you ever spent minutes in an aisle trying to remember if you actually have a spare bag of coffee at home? Having a list of already owned items will keep you from standing in that aisle trying to decide if you really need to buy something. While it’s a good idea to make a list of items you need for a week’s meal or a list of things you already own, it’s also a good idea to make a list of items that are running low. This will help you quickly add them to your weekly shopping list. It will also prevent you from wasting time in the store trying to remember how much you have left or whether you really need to buy the product yet. Have you ever gone into the grocery store and suddenly been inspired to make a completely different meal than what you had previously planned? Have you stood there searching the recipe on your smartphone to see if you needed to buy any extra items? Knowing what meals you plan to make will help you to get in and out of the grocery store quickly. You won’t waste time trying to decide if you want to make a new recipe and whether or not you need to buy new items. Shopping when you’re hungry is one of the worst mistakes you can make. Everything will look enticing and the smells from the bakery or deli might make you linger as you decide what you want to buy. Shopping with other people will distract you and slow you down. Sometimes that other person, whether it’s a friend or child, might convince you to buy something you don’t need. Or they might just distract you enough that you can’t focus on what you’re there to buy. Shopping by yourself, if possible, will allow you to buy everything you need without any distractions. I shop “mangers specials” for my meat i.e. clearance. So meal planning revolves around what protein I have on hand. I keep a detailed list on my smart phone of the proteins I have on hand and remove them after I have used an item. When inspiration strikes, from a TV show, grocery store, magazine or where ever, I write the meal plan in the note section of my iphone. I generally have 5-6 meal plans on my phone. This allows for flexibility depending on how my fresh vegetables are doing or an easier meal for those unexpected difficult days. I used to shop with a friend and usually we would do 2 or 3 dinners the same. After shopping we would go to either her house or mine and make our dinners together for our freezers. We stayed on our diets and in budget because we had an accountablility partner.